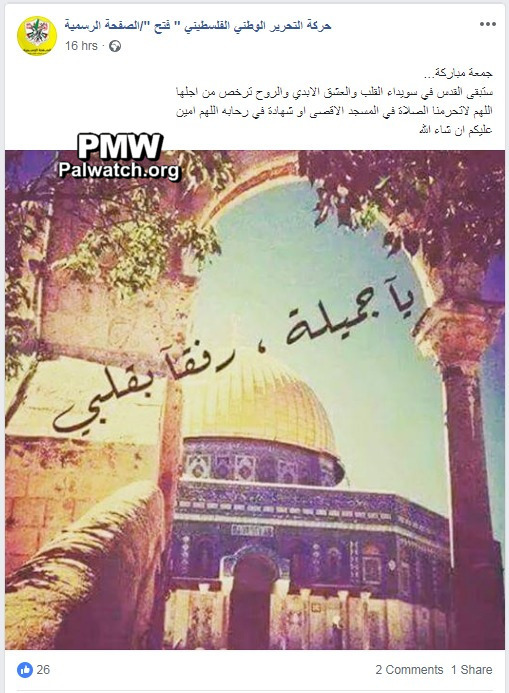 The Dark-Eyed [Virgins] yearn for me"
Fatah: "Allah, do not prevent us from Martyrdom-death in [Al-Aqsa's] plazas"
The ideal of dying as a "Martyr" continues to be promoted regularly by the Palestinian Authority and Abbas' Fatah party. 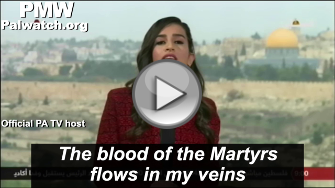 Palestinian Media Watch has documented that "Martyrs" have cult-like status in the PA. It should be noted that the terrorist was 17 years old and that the term "lion cub" repeated in the poem is the name for boys in Fatah's youth club, which is named "Lion Cubs and Flowers." The "lion cubs" - children of similar age or younger than the 17-year-old terrorist who is being honored in the poem and who the Dark-Eyed virgins yearn for - are being urged to kill - to "harvest souls" in the battle field. "Jerusalem... for its sake our souls are insignificant. O Allah, do not prevent us from Martyrdom-death in its [Al-Aqsa's] plazas"
Jerusalem will remain in the depths of the heart and an eternal love, and for its sake our souls are insignificant. O Allah, do not prevent us from the prayers at the Al-Aqsa Mosque or from Martyrdom-death (Shahada) in its plazas." The PA teaches that the scent of Martyrs' blood is cherished, Martyrs' funerals are celebrated, and parents think their dead children's "blood make gardens bloom." PMW has documented that Palestinian kids are brainwashed to believe that dying as a "Martyr" is something they should aspire to achieve. In school, for example, books teach kids that terrorist "Martyrs" are "heroes" and "the best of the best," and that "everyone wants to be like them." When 16 teenage terrorists died as "Martyrs" during their terror attacks, the official PA news agency Wafa praised them for having achieved Shahada - Martyrdom-death for Allah - rather than having obtained their matriculation exam certificate - also "shahada" in Arabic. The PA stated that "death [of a teenager] as a Martyr is the path to excellence and greatness, and the path of those who know how to reach the great victory." Abd Al-Rahman Abu Jamal was a 17-year-old Israeli Arab terrorist who stabbed and wounded 4 Israeli policemen at the Oz Police Station in Jerusalem's Armon HaNatziv neighborhood on Nov. 14, 2018. Abu Jamal was shot and wounded at the scene by other policemen, and died of his wounds on Nov. 20, 2018 in an Israeli hospital.